(8 minutes) In most instances, people who issue a request for proposal (RFP) are shopping for the lowest fee. Professional services are viewed as a commodity and little else. Avoid an RFP if you can. If you are seeking something with an unsolicited proposal, unless the outcome is essentially pre-determined, be prepared for a long process. If yes, be prepared for a lot of work. Proposals must be treated seriously and engaged with intent to win. It is critical, when considering competing for a project, or the favours of a donor or sponsor with an unsolicited or solicited proposal, to have enough intelligence about the project and prospective client. Intel can be gathered through research and readily-available information to make an informed decision. Know the target organization and any competitors (SWOTT) – strength, weakness, opportunities, threats, trends (market/economy/politics). Be certain of the objectives of your employer and/or client. Available resources to compete with a proposal (staff power and technical capability). Timing for submission of the proposal. Is there time to do it right? Intelligence gathering – knowing all that is needed to know about the target and competitors. Presentation – at the beginning be prepared to present the proposal to the target. Language – Who is the audience that will recommend approval of the proposal and accept the recommendation? The proposal must be written for comprehension by a representative of Generation Y, X, or a Baby Boomer. Are the cultural nuances (if any) of the targeted proposal recipient known and understood? Profit margin – if there is a need for profiting from the proposal, does the profit margin promise to be worth the effort to compete with a proposal? Does the prospect favour another proponent? Have you had a successful project with the prospect? Is there a need for local staff or a specific individual on the project team to ensure success? What is the “opportunity cost” of the proposal? Is the proposal to help raise the brand awareness (if successful) or will it damage the brand if unsuccessful, reduce staff with increased technology, or place more pressure on staff with increased workload? Clearly understand what is asked in the Terms of Reference. You may need to clarify points with the prospect. 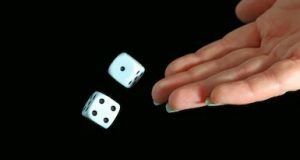 You may wish to determine if the prospect would accept alternatives to the terms of reference, new ideas or a different approach to solving the problem. Who is the main competition, if a competitive environment exists? How many competitors are there, and what are their strengths and weaknesses? Determine the project team names likely to be included in a competitor’s proposal and know their strengths and weaknesses, and existence of a relationship with the prospect. Have an idea of the depth of the competitor(s)’ resources and their pattern of fee proposals (i.e. low bidder or fair fee proponent). Consider strategic alliances to win a portion of the work that fits best with the strengths of your employer or client. Clearly understand and be committed to the amount and nature of work to be contracted. 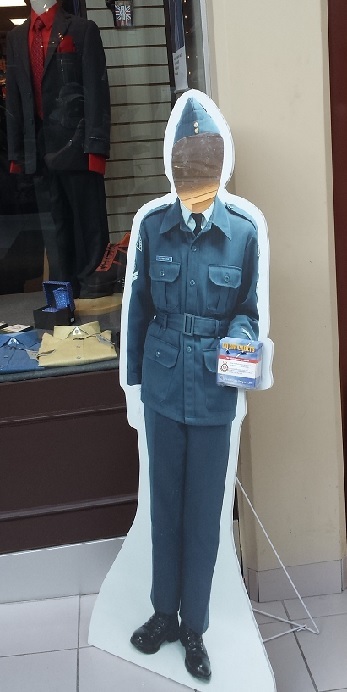 A field visit may be warranted. Alert the prospect without tipping competitors if inconsistencies exist between your research and the terms of reference. What is the real purpose of the Request for Proposal? Terms of reference are usually drafted for a component of a larger challenge facing a proponent. Interview the proponent to determine what is really behind the proposal call or the mandate of a donor/sponsor organization and see if this can be addressed in the proposal. The goal of any proposal is to set the stage to negotiate a contract for a project and bring closure to the process (i.e. sign a contract). A proposal is a document that outlines a scope of service and sets a price. It is a legal document and forms the basis of a contract. It should be submitted with the corporate endorsements. It is a sales tool that can edge your firm past the competition if price is not the deciding factor. The art of proposal competition is to close the gap between what the prospect wants and what the proponent is selling. Successful proposals are unique. What sells are the differences, not the similarities to competitive proposals. Unique services must be translated into benefits to the prospect and claims must be supported with evidence and testimonials. Taking on a proposal that does not suit the business plan or resources of the entity responding to the RFP. The most common reason for failure is “Failure to respond to the Terms of Reference.” The number 2 reason is price, or not understanding the availability or timing when project funds are available. Selecting the proposal manager and preparation team that can complete the project according to the terms of reference. Accurate background information and research. Abort/Proceed decision carefully debated and considered. Establishment of a good relationship with the entity issuing the RFP and key people of the entity before a proposal is submitted. Selection of a project team acceptable to the entity issuing the RFP before the proposal is submitted. A Table of Contents that takes the reader of the proposal to sections of interest very quickly. Graphics including images, charts and graphs that are appealing to the RFP entity. A proposal preparation schedule/timetable that will result in a submission that is on time. Clear assignments for each member of the proposal team. Identification and presentation of unique elements of the project in the proposal. Set fees and pricing that are acceptable to the prospect. Review of first draft by the proposal team and members of the project team. Final edits by proposal manager. Production of the RFP according to plan and schedule. Submission on time and to the right people or person. Follow-up as if negotiating a contract. Preliminary preparation for presentation of the proposal by the proposal team or key project team member. (7 minutes) In another time and place, I was hired to manage and provide marketing services for an industry that was being overshadowed by the marketing activity of competitive products. Internet access was limited and debate over its cultural acceptability and value for business raged. PCs and laptops were affordable for businesses and being used primarily for engineering and word processing. Cell phones were novel. Notebooks, pads, smartphones, and other mobile devices and the software to drive and add value to the machines were still in their infancy. We were experiencing the dawn of a new era in marketing and communications. To effect change in perception, the platforms available were traditional offline print media, lobbying, research into competitive products and relationship building to influence specifications. The Internet was of no value. In the 1980s and early 90s, thermoplastic conduit for drainage pipeline systems and culverts was entering the construction market in a big way to compete for market share held by corrugated steel and precast concrete. Thermoplastic conduit and corrugated steel were much cheaper than concrete when only the capital cost of the flexible products was considered. Concrete could not compete on capital cost alone. The threat from the thermoplastic industry was nothing short of visceral for the many small independent companies that produced concrete pipe. Representatives of thermoplastic conduit materials had successfully changed the perception of concrete pipe for drainage systems, declaring that a new age had arrived and that concrete pipe was a dinosaur and ready to be relegated to the fading light of history. All drainage products were being treated as commodities to be had for the cheapest capital cost. I had entered the land use planning and marketing world 12 years earlier while working for a large private sector engineering and planning firm established in 1912. There wasn’t much of Ontario’s infrastructure that the company had not been involved with at one time or another. Working with civil, water resources, and environmental engineers and land use planners educated me about why products and materials were specified and sometimes, how. I promoted the engineering company through publishing stories about major public works and private sector projects that used all materials for site servicing. The consulting firm enjoyed great successes and wealth, recognized by awards to its engineers and projects. I came to the concrete pipe industry with a different way of seeing infrastructure development and a sound foundation of marketing professional service in an extremely competitive environment. I was ready for a fight. From the perspective of an outsider looking through the dusty windows of an industry that had been around since the late 1800s, there was too much reliance on contractors to do the right thing and specify concrete pipe. The problem is that contractors must bid on projects and the lowest cost bid almost always wins. Cheaper drainage products in the bid equated to lower bid prices and perhaps a win for the contractor. If concrete wasn’t specified by the owner of the project or consulting engineer, chances of having concrete placed in a bid were not high. Tight relationships with the owner of a pipeline construction contractor were vital. Perceptions about concrete pipe had to change quickly. Quality was improving, availability was assured, the industry was united behind a well-funded concrete pipe association. The marketing guy introduced an advertising campaign in media read by consulting engineers, contractors, specifiers, public works officials and municipal/provincial government politicians. The first two advertisements would embrace the age of the concrete pipe industry and pitch the durability of concrete pipe that has a service life much longer than that of thermoplastic and corrugated steel. 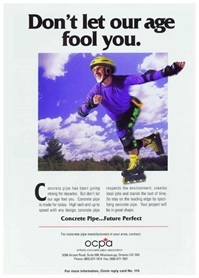 He created an emotional appeal to the concrete pipe industry message by showing images of seniors performing youthful physical activities like lifting weights and rollerblading. There were no pipe photos in the ads, only an image that stood out and a message proclaiming, “Don’t let our age fool you.” These were the first and best of a series of display ads that ran for several years, repeated on posters at trade shows and special events. Slowly perceptions changed and set the concrete pipe industry on a new course that focused on lobbying, while editorials and occasional display ads continued in major industry offline media. Tactic learned – Pull the competition into an action to distract them, while new fronts with new tactics are opened. There is much to be learned by a professional marketer from past military battles and wars waged by generals who were masters in understanding human behavior and basic needs of the body and spirit. Sun Tzu is known for the tactical side of military strategy while Von Clausewitz believed that strategy should be based on flexible principles. Mao Zedong was a master at guerrilla warfare. Many marketing professionals specialize in strategy, tactics and guerilla marketing techniques. There is a lot to learn from the masters to hone the skills of marketers who plan and initiate marketing programs that are good for business. History confirms that innovative technology can win the field for a while, but to maintain the momentum of success, marketers must be experienced strategists and tacticians to gain market share and hold what has been taken. The Battle of Hastings on October 14, 1066 between the Norman-French army of Duke William II of Normandy and an English army under the Anglo-Saxon King Harold Godwinson was a Norman victory where the plan of battle was heavily influenced by the Norman longbow. 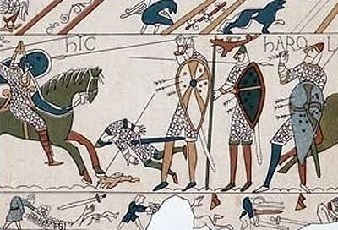 The technology introduced to the field thinned the Anglo-Saxon lines when Norman archers loosed volleys of arrows that rained on Harold’s army positioned on the high ground. The Anglo-Saxon infantry pressed together seeking protection of shields while leaving their flanks exposed. Norman cavalry took advantage of the weakened lines and shattered Harold’s defenses to take victory from a force that had the best field position. The powerful longbow had created opportunity for victory. The battle of Hastings demonstrates how a marketer can champion a modified technology to help capture market share. There are numerous products that share a common function, but improved features can increase market share. Much like the Norman longbow, Tide laundry soap is one of many soap products. When Procter & Gamble introduced cold water Tide, it contributed to the reduction of electricity in the home used to heat water. Through marketing campaigns, consumers believed that they could save money by purchasing Tide, designed for use with cold water. Market share was gained at the expense of hot water laundry soaps. Understanding the technology of competitors can open opportunity when existing technology is modified to overcome defenses set up by competitive products. Sun Tsu believed (among many other teachings) that it is imperative to assess “war” under five fundamentals: the way, the weather, the terrain, leadership and discipline. 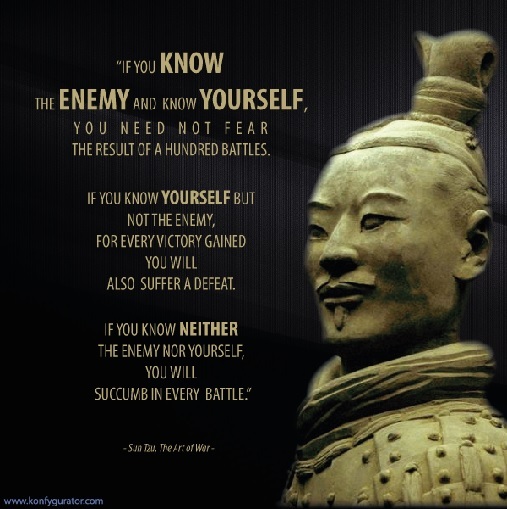 Some say he described the “way” as examining yourself and your opponent to determine who is most likely to prevail. This action is very much like performing a SWOTT (strength, weakness, opportunity, threat, trends) analysis or PEST (political, economic, social, technological) analysis of a corporation, brand, product or service when starting a business, entering a new market, or introducing a new product or service. Only after conducting a SWOTT and PEST analysis would you mobilize forces or assemble resources and examine the 7 Ps of the marketing mix. The weather means the seasons. There are good times of year and optimal periods in the business cycle to carry out campaigns. It is inadvisable to enter a competitor’s territory at an unfavourable time. Consider the winter campaigns of Napoleon in Russia and the fate of Hitler’s 6th army at Stalingrad. From a marketing perspective, it is wise to enter new territory or launch a campaign when the conditions are favourable for success. Disney takes advantage of the seasons in North America to release new movies during festive seasons when people have the time and inclination to entertain themselves and others by gifting and spending time together. The terrain is to be assessed in terms of distance, difficulty or ease of travel, dimension and safety. When you know the terrain you can enter a territory directly or a circuitous route. Ease of travel determines the use of infantry or mounted troops. When you know the dimensions, then you know how many troops you need—many or few. When you know the level of safety of the terrain, you can decide to do battle or disperse. For a marketer, it is vital to any level of success to have a clear map of the marketplace. That means the geographic extent of the marketing campaign, competitive territory whether it is a notion under siege or a physical place. Marketers should understand how to build and use mental maps of markets that clients and customers perceive to be able to provide the best service and customer experience (CEM) possible. And, marketers must have some premonition or knowledge of the consequences of entering a new territory with regard to public safety of products and services that may well reflect on the health and safety of the marketer personally! Poor choices can be career-limiting. Sun Tzu remarked that leadership is a measure of intelligence, trustworthiness, humanness, courage and sternness. Intelligence is to know when to plan and change effectively. Trustworthiness made people aware of punishment or reward. Humaneness means love and compassion for people being aware of their toils. Courage means to seize opportunities to make certain of victories without vacillation. Sternness according to Sun Tsu is establishing discipline in the ranks by strict punishment. Professional marketers are leaders and may report to corporate officers for guidance and strategy/budget approvals in a corporate environment. They should know what constitutes leadership, and if they have none of their own in an organization, they must seek champions that can take on the leadership role in implementing a marketing campaign. All successful marketing campaigns have strong leadership with a will to be successful by mobilizing staff and other resources to achieve desired outcomes. 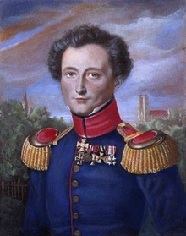 Carl von Clausewitz was a Prussian general and influential military theorist. He is most famous for his military treatise Vom Kriege (On War). A company must look for weak points in the positions of its competitors and then launch marketing attacks against those weak points. General von Clausewitz preached that wars are won in almost every case by superior forces. Translating that to marketing strategy, Al Ries says that bigger companies normally can defeat smaller companies and it’s difficult to dethrone a king. The defensive form of war, Gen. von Clausewitz writes, is in itself stronger than the offense. There are three basic principles of defensive marketing warfare, according to Marketing Warfare, by Al Ries and Jack Trout. “Defensive Principle No. 1: Only the market leader should consider playing defense. The problem with this, says Mr. Ries, is that he has never met a company that didn’t consider itself a leader. Most companies fool themselves with creative definitions of leadership. Companies don’t create leaders, he writes, customers do. It’s who the customer perceives as the leader that defines a true category leader. Defensive Principle No. 2: The best strategy is the courage to attack yourself. In other words, you can strengthen your own position of leadership by introducing new products or services that make your existing ones obsolete. 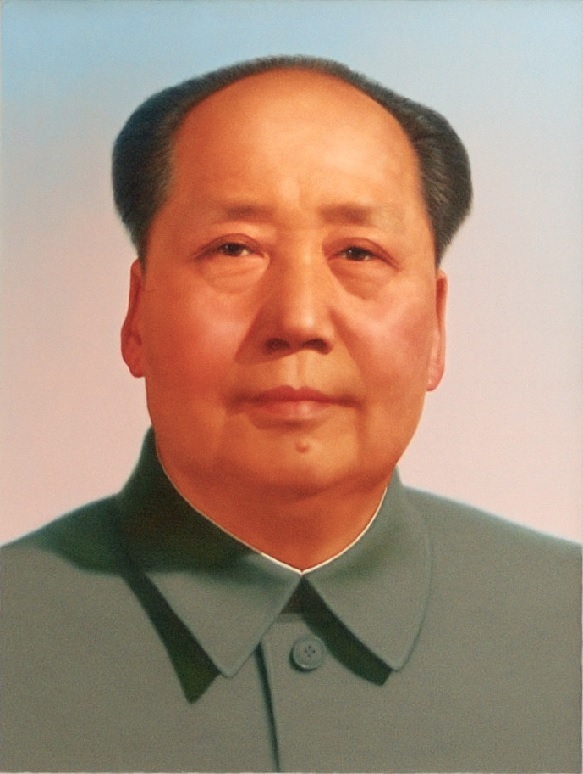 Mao Zedong (Chairman Mao), was a Chinese communist revolutionary and founding father of the People’s Republic of China, which he ruled from 1949 until his death in 1976. A master at guerrilla warfare, Mao Zedong saw objectives other than the heart of the enemy army’s offensive power. These objectives were the enemy’s supply lines, rear bases, and isolated enemy detachments, outposts or garrisons. If Mao could strike at these objectives, while avoiding the enemy’s main strength, he could force the enemy to defend them. This would give the initiative to Mao’s weaker force and compel the stronger enemy to concentrate most of his strength in guarding his rear and his lines of communication and supply. Recognizing that the enemy’s rear is his most vulnerable target, Mao abandoned any attempt to defend a front or main line of resistance. This obliged him to give up orthodox warfare in which one army directly confronts another and attempts to destroy it. In Mao’s system, orthodox war could only come at the final stage just prior to victory, after the enemy had been weakened and demoralized. To prepare for this culminating stage, he adopted indirect warfare, essentially guerrilla in its operation, that avoided a straightforward challenge to the enemy’s main strength. Professional marketers who represent small to medium-sized enterprises are often engaged in one form or another of guerilla marketing to compete in a crowded market space. Often they have few funds to launch and sustain a long-term marketing campaign. Modern business owners are looking for an immediate ROI and look to their marketers to produce results regardless of changing market conditions, sales competencies and the strength of competitors. This is where the best of the best professional marketers stand out. There is much that a marketer can do with a well-funded marketing program, but when you are faced with few resources, guerrilla marketing may be the only option for the enterprise. Combining web analytics, CEM, sales, and other data will provide a good indication of prospects and where they like to spend time online. Social media sites provide metrics that are also valuable for market research, as are the digital and paper files in municipal offices about demographics and community growth. All of this market research data and information is available at little cost—an advantage for businesses with little or no money for market research. Internal marketing to build the competencies of staff and colleagues in delivering marketing messages enhances the quality and strength of a small sales force. Using YouTube, blog sites and podcasts to message prospects and existing clients can result in building customer bases and leads quickly and efficiently. By targeting the markets and customers of competitors and entering market space in an unexpected way it is possible to build market share by offering products and services that have features that strongly differentiate from those of competitors. There is much risk involved in guerilla marketing techniques—especially if the product or service being offered is of lower quality and of little need or value to consumers. In that case, the professional marketer has an ethical responsibility to the public to provide accurate information about the product or service and to offer a professional opinion to the enterprise of its likelihood of success. Entering a market space with a low-priced inferior product, while mistaking the tactic for guerilla marketing only hurts the businesses that are already established along with the enterprise behind the “low-price” campaign. There are volumes published on the way businesses can learn from tactics used in battles past and master warriors—ancient and modern in all nations to market goods and services. This knowledge can add to the skills and resources of the twenty-first century professional marketer. With a foot in the past, a sense of future trends, and an acute awareness of the present moment for decision making and taking, professional marketers have an advantage over those who dabble in marketing.